School districts have discretion in determining when English learners can be reclassified as proficient in English, meaning they no longer need help in gaining fluency. But the different criteria that districts use and wide disparities in reclassification rates among districts have prompted Sen. Alex Padilla, D-San Fernando Valley, to call for consistency . Padilla discusses his bill during a televised hearing Wednesday of the Senate Education Committee. His bill, SB 1108, requires the California Department of Education to recommend uniform reclassification criteria, based on best practices, to the State Board of Education and encourages the board to adopt the changes. The bill also would recognize reclassified students as a subgroup for the Academic Progress Index so that the state would be able to track how well these students do over time on the state’s standardized tests. SB 1108 passed its first hurdle Wednesday with a 5-1 vote in the Senate Education Committee and now goes to the Senate Appropriations Committee. It was endorsed at the committee hearing by representatives of several organizations advocating for English learners. As Padilla noted in an interview, the 1.3 million Reclassified Fluent English Proficient students, as they are called, are nearly as numerous as the 1.5 million English learners in California. Together they make up 45 percent of the state’s students. So what happens to reclassified students ­– the curriculums and services they receive as English learners, how they are reclassified and how well they perform afterward – should be a state priority, he said. Students who are reclassified too soon may lack the fluency in English to do well. Those retained too long in support classes, particularly in middle school and high school, may not acquire credits needed for college. Padilla has beat this drum before. Two years ago, the Legislature passed SB 1108, a similar version of the current bill, which required the Department of Education to determine best reclassification practices by Jan. 1, 2014. But the research was contingent on state, federal or private funding, and the department said the money didn’t come, so the work hasn’t been done. 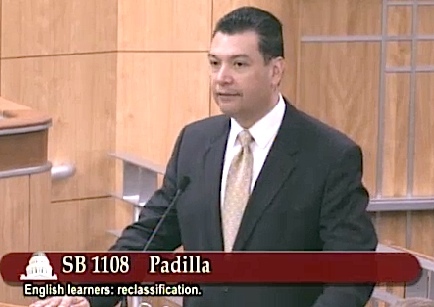 In the new SB 1108, Padilla resets the deadline to Jan. 1, 2016 without the funding contingency. However, the department has requested that Gov. Jerry Brown add money for the research in the May revision of the state budget, and Padilla said he was optimistic it would be included. On average, between 12 and 15 percent of English learners are reclassified each year. A report released by the Public Policy Institute of California earlier this year confirmed Padilla’s suspicion that the criteria used by districts varied significantly, resulting in a wide range of reclassification rates. They also found that 90 percent of the districts responding to their survey used more demanding reclassification criteria than the State Board of Education guidelines recommend. Districts using more stringent reclassification criteria had lower reclassification rates. Those districts that require that students take the math test and score higher on the California English Language Development Test than guidelines recommend reduce their annual reclassification rates by nearly half, the study said. Its conclusion: “There may be room to lower reclassification standards in districts using more rigorous thresholds and still ensure” that reclassified students do well enough that they would not need further academic supports. The institute researchers and Padilla agree that the time is right to rethink reclassification. The state has adopted new English language development standards for English learners and will introduce a new version of the CELDT, aligned to the Common Core standards, in 2016-17. The state has discontinued state standardized tests and is transitioning to the Smarter Balanced tests for the Common Core standards.The institute’s Hill said whatever minimum score is determined to be appropriate for reclassification purposes should be required for all districts. Padilla’s first version of SB 1108 would have mandated that the State Board adopt regulations incorporating the best practices that the state Department of Education recommends. On Wednesday, at the urging of the staff of the Senate Education Committee, he agreed to encourage, not require, the state board to act. John Fensterwald covers education policy. Contact him and follow him on Twitter@jfenster. Sign up here for a no-cost online subscription to EdSource Today for reports from the largest education reporting team in California. A clarification on how a child is classified as EL. If the parent indicates a language other than English is spoken at home, the child will take the CELDT whose score will determine if he/she is EL. Additionally I have never met a single teacher who indicates that a child is ready for reclassification based on a monetary incentive. Schools strongly push for reclassification as soon as possible which may compromise its validity. In your opinion, cortega, how many native English speakers would pass the CELDT, especially if they live in a lower socioeconomic environment where often the only reading material is the cereal box? Isn’t that the major problem highlighted by Geoffrey Canada, of Harlem Childrens Zone fame, that parents in the inner city simply do not have the extensive vocabulary necessary to erase the achievement gap? And doesn’t Krashen remind us over and over (sorry, Steve) that we need to bring books and libraries to young children so they increase their literacy? does it really matter what the teacher thinks if the district’s policy imposes a requirement that hinders reclassification (that a teacher cannot ‘override’)? I thought the federal program monitoring that comes with Title 1 etc would make problems for you if your ELL reclassification rate was too low. Certainly the teachers I’ve come in contact with felt a real urgency to get kids reclassified as soon as possible. Like Manuel, I suspect that a lot of kids classified as native english speakers would not pass reclassification. I also would remind policymakers that kids who come from predominantly non-english speaking homes still have additional costs and needs, between the fact that they are likely to need help with applications to American colleges and that materials must be translated for parents. Something that is not in any of this funding is a recognition that it is far easier and less costly if all your ELL kids speak say, Spanish, than if you are dealing with tens of handfuls of kids who speak other languages. i totally agree with your last paragraph (tried to make the same point in my comment but failed). this can be a huge barrier to success but not necessarily something someone would even think of when asked to name the services that should be being funded. How big of an issue is this for LCFF? How many reclassified english learners would get additional LCFF funding due to their economic situation? You make a good technical point, Paul Muench: If an English Learner were also from a low-income family, he or she would garner supplemental LCFF funds for the school district either way, so the district would have no revenue incentive to delay reclassifying him or her as proficient in English. Still, there must be some English Learners who are not low-income, or whose families have not submitted school lunch applications. I support this effort because uniform, and hopefully objective, criteria are good for students, and also because a uniform reclassification regime would make it harder for school districts to “game” LCF. Low-income status leaves districts plenty of room for “gaming”, because school lunch applications are rarely audited, as a practical matter or for policy reasons. 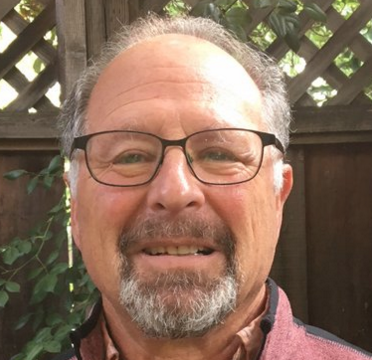 Paul(s): As the article noted, an estimated 75 to 85 percent of English learners come from low-income families, and English learners make up a quarter of students, so we are talking about perhaps 5 percent of schoolchildren overall. Teachers will tell you they haven’t considered dollars in the past when deciding on reclassifying students, but the stakes for districts were less then now, under LCFF. An argument for common criteria can stand on its own, money aside. Under the Local Control and Accountability Plan, districts are supposed to address the reclassification rate, so outliers with very low or high rates should be apparent for public scrutiny. Oops, missed that. I can see legislating this to make sure money is distributed fairly. But if this is just for the benefit of student learning it does seem to conflict with the spirit of LCFF, which is to have districts make local decisions. The research quoted in the article (Hill and Weston) does point to the variance in policies being a bad state of affairs. But the caveat about which students were included in the study does leave open the possibility that districts with different populations could see different outcomes. So perhaps local decision making is helpful. john is correct that the overlap with low income is very high and that will reduce incentive to delay reclassification. however, there is also no incentive to reclassify (the fact that theyre supposed to notwithstanding). it is however noteworthy that an original version of lcff (or something related) placed a time limit on revenue-producing english learner classification but that that was later removed. if it has little to no impact on funding, I have no idea why it would be removed. more generally, reclassified kids are among the highest scoring subgroups of all. this is likely why the state wants to add them to the api calculation. however, a reclassified subgroup will be more confusing than it is clarifying. many reclassifieds are high-performing, mostly english proficient students to start out with but maybe come from a household where another language is spoken part of the time. so the reclassification rate may not be a valid indicator of how well a district or school is addressing ‘more traditional’ english as a second language needs. a breakdown of ell and refp by ethnicity, income level or parent education level would go a long way toward making the distinction more valid (and transparent). Back in the good ol’ days, districts were accused of keeping students in the EL classification because they were supposed to be getting the bilingual differential. We’ve had more than 15 years of Prop 227 and we still have a large EL population even though the bilingual differential is long gone. So what is the problem for reclassification? We have to ask first why so many are classified as EL. At LAUSD, if a parent says in the school papers that a language other than English is spoken at home, the child will be classified as EL. And it is a pain to get the school to change this, and it usually doesn’t happen until the kid tests basic-or-above in the ELA CST. For a kid in 1st grade, that takes the place of the CELDT, I think. Plus other tests which the kid has to pass with flying colors. I’ve often wondered what would happen if the same conditions were placed on native English speakers. But we don’t. We need more information, preferably longitudinal, because the numbers indicate that about 12% get reclassified every year yet the number does not get that much smaller as you go from K through 12.
i agree we need better numbers. i dont think this bill will achieve that. that it does not go far enough was part of my criticism. i do think its better to have more consistent criteria (in our district it was both cst and celdt, for example), and thats something the bill is trying to address. i would go further than wondering and actually suggest applying the same conditions (interventions) to native speakers. in initial years, a true non-english speaker has very specific needs, but after a couple to few years (depending on child and environment), if they are still classified, their needs (language-wise) are not much different than low-achieving native speakers. (this is the social vs academic english distinction). it is true that there are parent needs that continue to exist past the time that students are socially proficient, and it was difficult enough to fund those services in the past, it will be nearly impossible now that EIA has gone away. i also think it might become significantly easier to classify someone as ell than to classify them as low income with the introduction of the new income proof requirements (the things deasy was so up-in-arms about), especially for many of those very families that make up the overlap. that could be a real reason why it would still ‘make sense’ to delay reclassification (and why the limit on ell classification was removed). Indeed EIA has been absorbed into LCFF, but the Supplemental and the Concentration grants have taken its place. And they are much bigger than EIA-EDY ever was. The real question is whether or not districts are going to tell the publc how much is in that pot and, more importantly, will they let the local ELACs have oversight over their spending. I am not holding my breath over that. Also, do you think that districts will stop their habit of using categorical money (because this is what it really is) to supplant their budgets, not supplement? Old habits die hard, you know. BTW, most ELs are also classified as living below the poverty line. Since the funding is based on “unduplicated” counts, I doubt that reclassification will change the number very much. After all, you don’t cease being poor just because you are alleged to be able to speak academic English at the same level as your peers. Yes, it is bigger, but imagine my surprise when the first thing our district did upon hearing about lcff was suggest giving pink slips to all the eia funded resource teachers. its more, yet thats irrelevant if the funds are not used to support the same causes (the ones driven by elac in the old system btw — you can stop holding your breath, its out of school-level elac hands now.. 🙁 ). no dont think they will stop it, in fact, i think they may even increase it as now all that formerly categorical funding is fair game, not just the funds that were flexed the past half decade or so. my point about reclassification was simply that ell classification is much easier to ‘prove’ than poverty. i think edsource did a piece a few months ago about the difficulties districts (maybe specifically lausd) are having in proving the latter.